Here are the four best books for details on the Lincoln Assassination. It is a tale as familiar as our history primers: A deranged actor, John Wilkes Booth, killed Abraham Lincoln in Ford’s Theatre, escaped on foot, and eluded capture for twelve days until he met his fiery end in a Virginia tobacco barn. In the national hysteria that followed, eight others were arrested and tried; four of those were executed, four imprisoned. Therein lie all the classic elements of a great thriller. But the untold tale is even more fascinating. 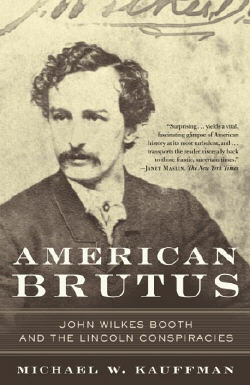 Now, in American Brutus, Michael W. Kauffman, one of the foremost Lincoln assassination authorities, takes familiar history to a deeper level, offering an unprecedented, authoritative account of the Lincoln murder conspiracy. Working from a staggering array of archival sources and new research, Kauffman sheds new light on the background and motives of John Wilkes Booth, the mechanics of his plot to topple the Union government, and the trials and fates of the conspirators. Piece by piece, Kauffman explains and corrects common misperceptions and analyzes the political motivation behind Booth’s plan to unseat Lincoln, in whom the assassin saw a treacherous autocrat, “an American Caesar.” In preparing his study, Kauffman spared no effort getting at the truth: He even lived in Booth’s house, and re-created key parts of Booth’s escape. Thanks to Kauffman’s discoveries, readers will have a new understanding of this defining event in our nation’s history, and they will come to see how public sentiment about Booth at the time of the assassination and ever since has made an accurate account of his actions and motives next to impossible–until now. In nearly 140 years there has been an overwhelming body of literature on the Lincoln assassination, much of it incomplete and oftentimes contradictory. In American Brutus, Kauffman finally makes sense of an incident whose causes and effects reverberate to this day. Provocative, absorbing, utterly cogent, at times controversial, this will become the definitive text on a watershed event in American history. 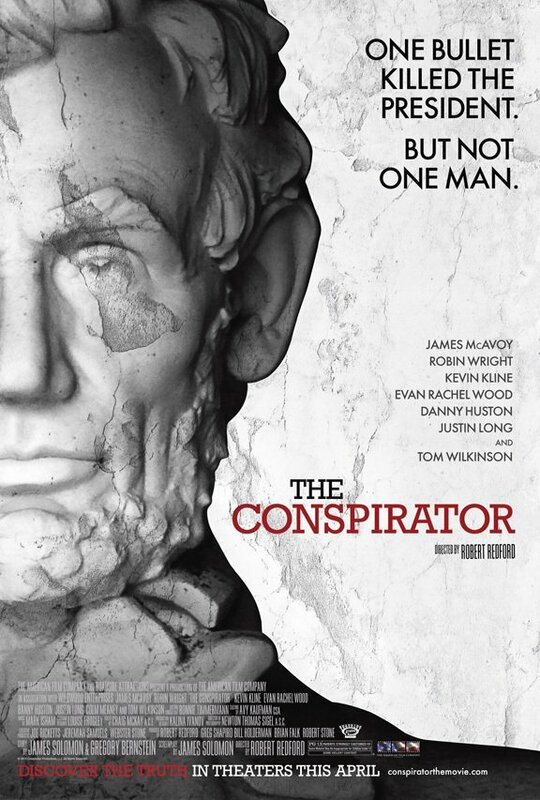 Set against the backdrop of the Civil War, The Assassin-s Accomplice tells the gripping story of the conspiracy to assassinate Abraham Lincoln through experience of its only female participant.Confederate sympathizer Mary Surratt ran a boarding house in Washington, and the depth of her complicity in the murder of President Lincoln has been debated since she was arrested on April 17, 1865.Calling upon long-lost interviews, confessions, and court testimony, historian Kate Clifford Larson magnificently captures how Surratt-s actions defied nineteenth-century norms of piety and allegiance. A riveting account of espionage and murder, The Assassin-s Accomplice offers a revealing examination of America-s most remembered assassination. “The murder of Abraham Lincoln set off the greatest manhunt in American history – the pursuit and capture of John Wilkes Booth. From April 14 to April 26, 1865, the assassin led Union cavalry and detectives on a wild twelve-day chase through the streets of Washington, D.C., across the swamps of Maryland, and into the forests of Virginia, while the nation, still reeling from the just-ended Civil War, watched in horror and sadness.” “At the very center of this story is John Wilkes Booth, America’s notorious villain. 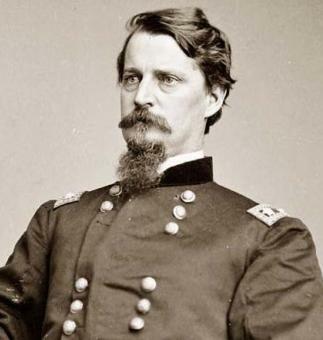 A Confederate sympathizer and a member of a celebrated acting family, Booth threw away his fame and wealth for a chance to avenge the South’s defeat. 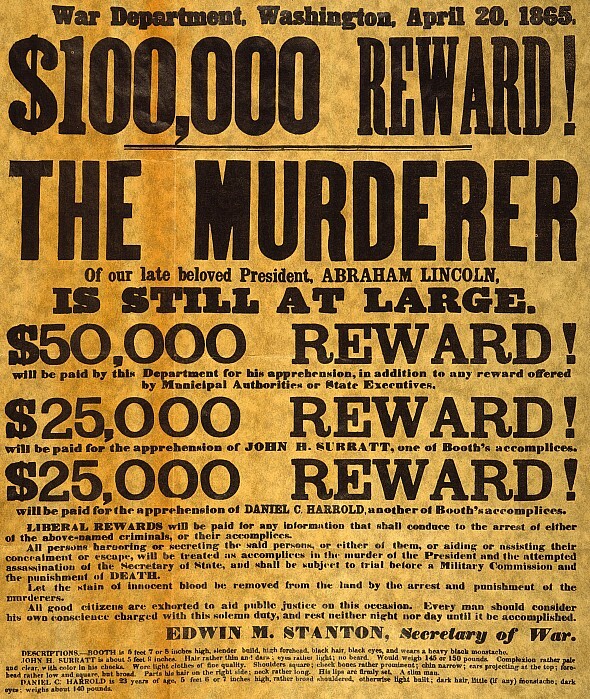 For almost two weeks, he confounded the manhunters, slipping away from their every move and denying them the justice they sought.” Based on rare archival materials, obscure trial transcripts, and Lincoln’s own blood relics, Manhunt is a fully documented work, but it is also a fascinating tale of murder, intrigue, and betrayal. A gripping hour-by-hour account told through the eyes of the hunted and the hunters, this is history as you’ve never read it before. 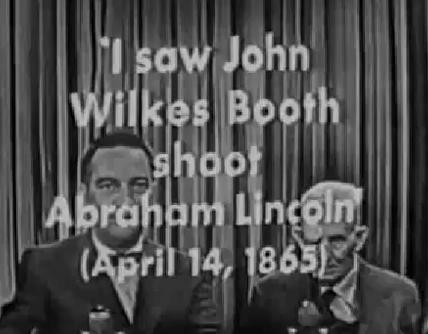 In some ways, Abraham Lincoln’s assassination at Ford’s Theatre was John Wilkes Booth’s most stunning theatrical performance. The assassin waited offstage until his cue (gunshot-muffling audience laughter); then burst into the president’s theatre; shot him and leaped onto the stage. According to historian Nora Titone, this play-stopping dramatic scene marked not just the end of Booth’s bombastic acting career; it was the climax of his bitter lifelong rivalry with his older brother Edwin. With persuasive force, Titone argues that John Wilkes’ jealousy of his sibling’s much more successful acting career fueled the hatred that culminated in a single violent act that changed history. Mary Eugenia Jenkins was born in Maryland in 1823. As an adolescent she attended a Catholic seminary for girls in Virginia, but at sixteen she married John Surratt, at least ten years her senior, and in 1840 settled with him in Prince George’s County, Maryland. 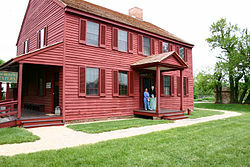 In the early years of their marriage the Surratts prospered as a result of John’s success as a planter, which allowed him to expand his land holdings and open a general store and tavern, making up the core of the community that came to be known as Surrattsville (now Clinton). In 1854, a post office was even established in town, with John as its first postmaster. John’s earlier achievements were undermined, however, by his excessive drinking, which led to neglect of his farm and crops and a steady decline in his fortunes. In August 1862, John died. The Surratts’ eldest son Isaac (b. 1841), having taken a job as a pony-express rider in Mexico, left Mary Surratt alone to care for her two younger children, Anna (b. 1843) and John, Jr. (b. 1844). Surratt struggled to manage what remained of the family’s holdings in Surrattsville, but she found it increasingly difficult, not least of all because John, Jr. showed so little interest in helping on the farm. 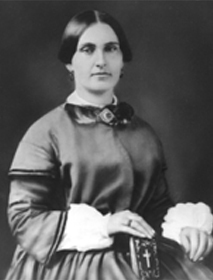 By fall 1864, Mary Surratt had moved with John, Jr. and Anna to a house on H Street in Washington, D.C., which her husband had purchased in 1853 and which she converted into a boardinghouse. Happily for the Surratts, the boardinghouse did quite well, with a small number of steady boarders and the constant flow of more transient traffic through the federal capital during the war. As early as 1863, John Surratt, Jr. – a loyal Southerner like his late father – began serving the Confederacy as a courier. In connection with this work, and with his college studies, John brought a number of people home to H Street, some of whom would later become entangled in the assassination conspiracy. In the spring of 1863, John introduced his mother to a school chum named Louis Weichmann, who took up residence in the Surratt boardinghouse in November 1864. 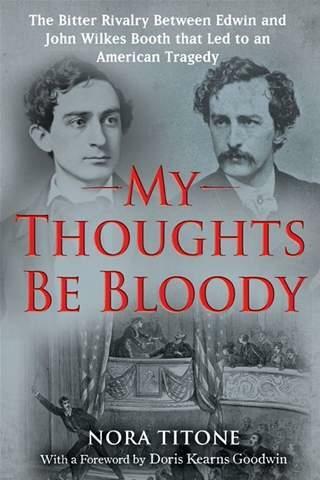 By January 1865, John had met and become good friends with the ardent secessionist and actor John Wilkes Booth. Subsequently Booth was a regular visitor to H Street as well. German immigrant and assassination co-conspirator George Atzerodt also stayed at the boardinghouse for a few days in February 1865, until Mary Surratt evicted him for excessive drinking. Posting as a Baptist preacher, Lewis Powell – later found guilty of the 14 April attack on Secretary of State William H. Seward – lodged at the Surratt boardinghouse for three days in March. It was not long after the shooting at Ford’s Theater that government investigators first descended on the boardinghouse. At approximately 2:30 on the morning of 15 April, several officials arrived and demanded to search the house in connection with the murder of the President. It appears that these men were looking for John, Jr., whom they believed at the time to have been the one to assault Seward. 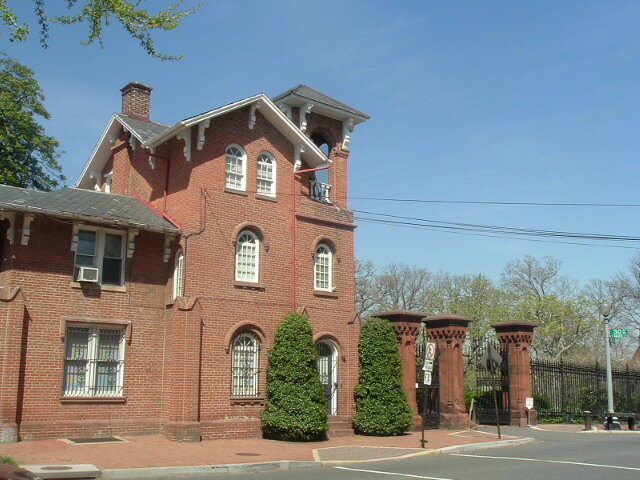 On the evening of the 17th, two detectives and two army officers returned, this time to arrest Mary Surratt and the rest of the people remaining in the house (Weichmann had slipped out on the 15th and was arrested that day; other boarders, disturbed by the crowds gathering around the house, had moved out on the 16th). Of the five who were arrested, all were women, with the exception of Lewis Powell, who arrived in disguise at the last, and for him most inopportune, moment. 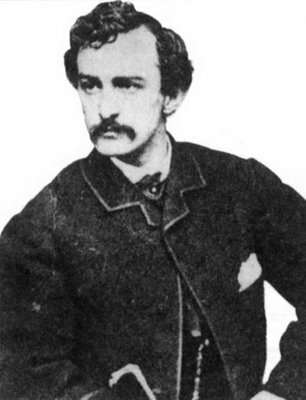 John Surratt, Jr., was nowhere to be found, and Booth had already escaped across the Potomac. Mary Surratt and the others were questioned intensively at the headquarters of General Christopher Augur, commander of the Union troops in the capital, and the women were taken to the Old Capitol Prison, where they were incarcerated. Although the other women arrested with her (including Anna Surratt) were subsequently released, Mary Surratt was not. Instead, along with Atzerodt, Powell, and five others (Samuel Arnold, David Herold, Dr. Samuel A. Mudd, Michael O’Laughlin, and Edward Spangler) Mary Surratt was charged in the conspiracy to assassinate the president and subjected to a trial by a military commission. The trial began on 11 May and ended on 28 June. All eight were found guilty in varying degrees, and on 5 July, when President Andrew Johnson issued his orders in connection with the commission’s verdict, four were sentenced to hang, Mary Surratt among them. 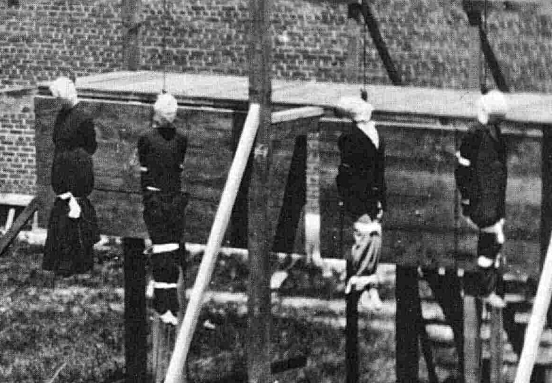 Gallows for Surratt, Herold, Atzerodt, and Powell were swiftly constructed, and on 7 July 1865, despite all expectations that her sentence would be converted, Mary Surratt was executed. The legitimacy of a military commission trying a case involving civilians, and the quality of both the investigation and the evidence supplied during the trial (particularly in her case) have continued to be matters of steady debate for well over a century. Doubts about Mary Surratt’s guilt were from the start exacerbated by her own unwavering claims – even to her priest – about her innocence. It does not help the cause of the prosecutors or the commission with its guilty verdict, or President Johnson with his determination to execute Surratt and the others as quickly as possible, that John Surratt, Jr., though finally captured and brought to trial in 1867, walked away free and lived until 1916. Bryan, George S. The Great American Myth: The True Story of Lincoln’s Murder (1990). Busch, Francis X. Enemies of the State (1954). DeWitt, David M. The Judicial Murder of Mary E. Surratt (1895; reprint, 1970). Eisenschiml, Otto. Why Was Lincoln Murdered? (1937). Moore, Guy W. The Case of Mrs. Surratt: Her Controversial Trial and Execution (1954). Trindal, Mary E., and Elizabeth S. Mary Surratt: An American Tragedy (1996). Turner, Thomas Reed. Beware the People Weeping: Public Opinion and the Assassination of Abraham Lincoln (1982). “Useless, Useless” actor declares as he gives up ghost at dawn. 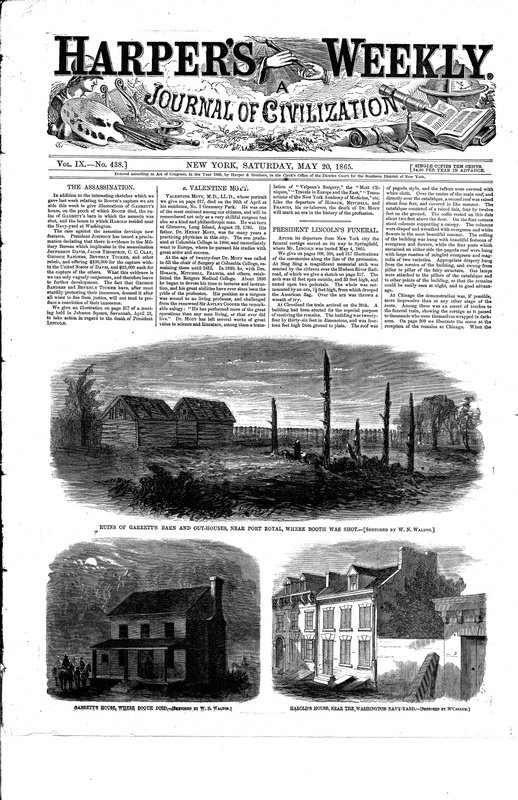 Harpers Weekly May 20, 1865 recounts the capturing and killing of John Wilkes Booth ending the 12-day chase for Lincoln's assassin. On April 24, 1865, Lieutenant Edward Doherty sits on a bench across from the White House conversing with another officer. The arrival of a messenger interrupts the conversation. The messenger carries orders directing Doherty to lead a squad of cavalry to Virginia to search for Booth and Herold. Scouring the countryside around the Rappahoneck River, Doherty is told the two fugitives were last seen at a farm owned by Richard Garrett. Doherty leads his squad to the farm arriving in the early morning hours of April 26. “I dismounted, and knocked loudly at the front door. Old Mr. Garrett came out. I seized him, and asked him where the men were who had gone to the woods when the cavalry passed the previous afternoon. While I was speaking with him some of the men had entered the house to search it. Soon one of the soldiers sang out, ‘O Lieutenant! I have a man here I found in the corn-crib.’ It was young Garrett, and I demanded the whereabouts of the fugitives. He replied, ‘In the barn.’ Leaving a few men around the house, we proceeded in the direction of the barn, which we surrounded. I kicked on the door of the barn several times without receiving a reply. Meantime another son of the Garrett’s had been captured. The barn was secured with a padlock, and young Garrett carried the key. I unlocked the door, and again summoned the inmates of the building to surrender. “I said, ‘If you don’t come out, I’ll burn the building.’ I directed a corporal to pile up some hay in a crack in the wall of the barn and set the building on fire. “I then motioned to the corporal to desist, and decided to wait for daylight and then to enter the barn by both doors and over power the assassins. “I told him I had not come to fight; that I had fifty men, and could take him. “At this moment Herold reached the door. I asked him to hand out his arms; he replied that he had none. I told him I knew exactly what weapons he had. Booth replied, ‘I own all the arms, and may have to use them on you, gentlemen.’ I then said to Herold, ‘Let me see your hands.’ He put them through the partly opened door and I seized him by the wrists. I handed him over to a non-commissioned officer. Just at this moment I heard a shot, and thought Booth had shot himself. Throwing open the door, I saw that the straw and hay behind Booth were on fire. He was half-turning towards it. “He had a crutch, and he held a carbine in his hand. I rushed into the burning barn, followed by my men, and as he was falling caught him under the arms and pulled him out of the barn. The burning building becoming too hot, I had him carried to the veranda of Garrett’s house. Clark, Champ. 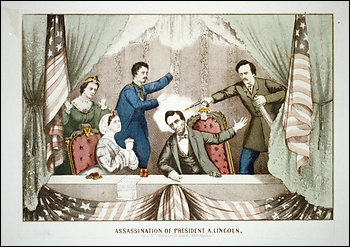 The Assassination: Death of the President (1987); Doherty, Edward P., Pursuit and Death of John Wilkes Booth, Century Magazine XXXIX (January, 1890); Kunhardt, Dorothy. Twenty Days (1965). On this date, 146 years ago – Maj. Gen. Winfield Scott Hancock ordered the following handbills printed and distributed to free blacks in the communities of Virginia and Maryland along the Potomac River. John Wilkes Booth, President Lincoln’s assassin, and David Herold, Booth’s accomplice, were still on the run after 10 days. Your President has been murdered! He has fallen by the assassin and without a moment’s warning, simply and solely because he was your friend and the friend of our country. Had he been unfaithful to you and to the great cause of human freedom he might have lived. The pistol from which he met his death, though held by Booth, was fired by the hands of treason and slavery. Think of this and remember how long and how anxiously this good man labored to break your chains and to make you happy. I now appeal to you, by every consideration which can move loyal and grateful hearts, to aid in discovering and arresting his murderer. Concealed by traitors, he is believed to be lurking somewhere within the limits of the District of Columbia, of the State of Maryland, or Virginia. Go forth, then, and watch, and listen, and inquire, and search, and pray, by day and night, until you shall have succeeded in dragging this monstrous and bloody criminal from his hiding place. You can do much; even the humblest and feeblest among you, by patience and unwearied vigilance, may render the most important assistance. Large rewards have been offered by the Government, and by municipal authorities, and they will be paid for the apprehension of this murderer, or for any information which will aid in his arrest. But I feel that you need no such stimulus as this. You will hunt down this cowardly assassin of your best friend, as you would the murderer of your own father. Do this, and God, whose servant has been slain, and the country which has given you freedom, will bless you for this noble act of duty. All information which may lead to the arrest of Booth, or Surratt, or Harold, should be communicated to these headquarters, or to General Holt, Judge Advocate General, at Washington, or, if immediate action is required, then to the nearest military authorities. All officers and soldiers in this command, an all loyal people, are enjoined to increased vigilance. Sarah Olivia WESTON was born in West Randolph, Orange, Vermont. Educated at home, chiefly under private tuition. She continued her studies in Boston, devoting her attention principally to the classics and history, under the direction of several noted professors at Cambridge, she being the second of the few female students to whom the privileges of Harvard University were granted. Her thorough knowledge of the ancient languages were of great service to Prof. Elliot Coues in his famous work on Ornithology, the “North American Birds,” in which a glowing tribute is paid to her attainments. soon attained distinction in legal and journalistic circles, having been the attorney and counsel of Mrs. Surratt, one of the Lincoln conspirators, and being the editor of several newspapers in Washington. At the time of his death, in 1878, resulting partly from injuries while serving on the General staff of Gen. W.S. Hancock during the late war, he was one of the most widely known and successful journalists. Her parents were Judge Edmund Weston and Sarah Weston (nee Edson). She died Friday May 25, 1900 at 2:45 p.m., and buried in a private funeral, according to her death notice. Her Washington Post obituary makes mention of her involvement with a “Theosophic Society” and her employment as a clerk in the office of the auditor for the U.S. Treasury Department in Washington, D.C.
“The melancholy news of the sudden death of Col. Frederick A Aiken, city editor of the Post, reached this office yesterday after we had gone to press, and filled every heart with the shock which so unexpected and sad an event was likely to produce in circles where the deceased was so esteemed and beloved. At his desk on Thursday night, his absence the rest of the week was ascribed to an ordinary hepatic complaint with which he was known to be affected, and the sad truth therefore fell with heavier, because unlooked for, force. “Frederick Argyle Aiken was born in the city of Boston, Massachusetts in the year 1837, and consequently was only in the 41st year of his age at death. . . During the early years of the war he was a volunteer aide with the rank of captain on the staff of General Hancock, and participated gallantly in several engagements, during one of which he had two horses shot under him, and received injuries the ultimate effect of which no doubt hastened his death. During the dark days of 1863 and 64 when the Democracy of the District made so gallant a fight under the leadership of Col. Thomas B Florence . . . Aiken was one of the most active workers in the Democratic cause, and his brilliant pen and eloquent voice were incessantly employed. When that unfortunate victim of Republican fury, Mrs. Mary Surratt, was dragged from her bed at midnight by the brutal minions of Stanton, and hurried before a court-martial organized to convict, Col. Aiken was one of the gallant few in the District that dared to lift his voice in behalf of justice and right at the imminent risk of his life and nobly undertook to conduct her defense. His defense of Mrs. Surratt is one of the . . . most praiseworty efforts on record. Col Aiken’s memorable speech on that occasion will be long remembered as fulfilled prophecy, everyone now believing her to have been innocent. After this trial, Col. Aiken was called on . . . to assist in the defense of Jefferson Davis, and prepared some of the preliminary papers in that case. “In 1865 he was admitted to the Supreme Court of the United States and practiced in that and the District courts with such esteem until 1868, when he gave up law for his former and most loved . . . journalism. He had previously, during the war and after, assisted Col. Tom Florence in editing the ‘Constitutional Union,’ and in 1869 became the editor of the ‘Sunday Gazette.’ The ‘Herald’ of Washington remembered the brilliant success which attended Col. Aiken’s management of this journal. In 1871 he became the dramatic editor of the ‘National Republican.’ In 1876 he was attacked with a heavy fit of sickness which consigned him to the verge of the grave, and from the affects of which he never totally recovered. “In the winter of 1877, Col. Aiken started with the ‘Post’ at its city editor position, which he held until the time of his death, he being the first of its staff that has died. He died at twenty minutes past twelve o’clock Sunday night after only three day’s sickness that his friends felt but little anxiety for his condition. “Gifted, brilliant, and versatile, having in a very marked degree the power of winning and retaining the affection of both men and women, singularly kind-hearted and benevolent, the death of Fred Aiken leaves a void in the hearts of his friends which may not be filled. His presence cast sunshine wherever it went. He had always a cheering smile for the erring, a kind word for the struggling, an open hand for the unfortunate, and a big free heart for those he loved. His handsome, manly appearance will be long remembered and by none more so than by his journalistic and literary friends. The obituary in the Washington Post is incorrect. First off, his middle name was not Argyle. According to his birth record and marriage record, he was born Frederick Augustus Aiken on September 20, 1832 (a full five years earlier than the cemetery record which is the source for most of the inaccurate information) in Lowell, Massachusetts. His parents were Solomon S. Aiken and Susan Aiken (nee Rice). As of April 30, 2011, a rare 1864 letter from Frederick Aiken was available for sale. Click here for details. For more information on the Lincoln Assassination and how the research has changed over the years, including the dispelling of popular myth with facts, click here. UPDATE December 21, 2011: For a more comprehensive look at the legal career of Frederick Aiken, click here. Lincoln Assassination Trial Attorney. A Massachusetts native he moved with his parents to Hardwick, Vermont when he was ten years old. As a young man he studied at Middlebury College from 1855 to 1857. Drawn to journalism he became the editor of theBurlington Sentinel. After he married Sarah Olivia Weston (1846-1900), daughter of Judge Edmund Weston in Randolph, Vermont, he began the study of law. In 1859 he was admitted to the Orange County, Vermont bar, moving to Washington, D.C. in 1860. When the Civil War began he joined the volunteers, becoming an aide with the rank of Captain on the staff of General Winfield S. Hancock. He returned to the law in 1863 when admitted to practice in the Supreme Court of the United States and in the District of Columbia Courts. He was best known for his defense of Mrs. Mary Surratt, accused of conspiracy in the assassination of President Lincoln. His speech in her defense was included in the The World’s Best Orations in 1899. In 1868 he returned to the practice journalism. In 1877 he became the City Editor of The Washington Post, a position he held until his death after an illness of two days. Although his grave is unmarked he is buried in the North Hill lot containing the grave of Tennessee United States Senator and Secretary of War, John H. Eaton. Plot: North Hill, Lot 79. Unmarked burial.